For 30 years, Ferdinand Rodricks has been modifying cars to suit disabled drivers. In doing so he has transformed their lives forever. A 27-year-old scientist contracted polio while being vaccinated against it. Based in Sion, north-central Mumbai, Bhagyam is a very vibrant and cheerful young lady who is a genetic engineer. Bhagyam had her fair share of discrimination from society, schools and colleges she attended, but she verifies that she was brought up no differently from her sister or any other 'normal' person. She says people misunderstand helping and guiding those in need and instead go overboard. "If I fall on the road, all I need is a hand to get up. What people try to do is carry me which makes me very uncomfortable," she says. "When people try to be over sympathetic, I tell them I am not pregnant, I am just a little disabled," she adds. She wants to be independent and live without having to depend on anything or anyone. Persuaded by her sister, Bhagyam was inclined towards buying a car and modifying it to her needs. "I was very sceptical and wasn't sure if I should get myself a car. I didn't know how to drive. I have always been driven by my dad or mom to school and college. Even now my father drops me at a common place where our office bus picks me up." Everything changed after she learnt about Ferdinand Rodricks. 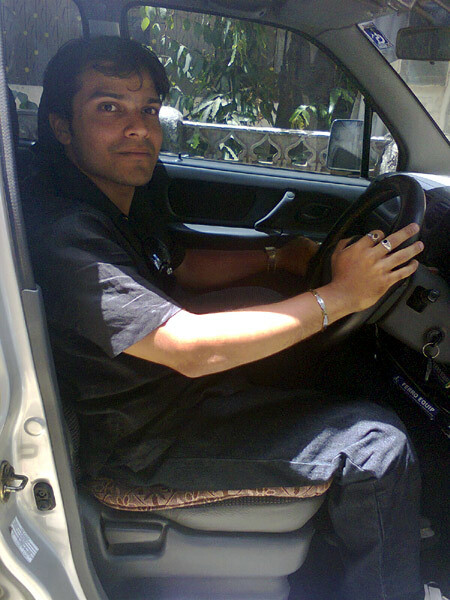 On March 25, 2012, she bought a second hand automatic Santro and got it modified by Rodricks. 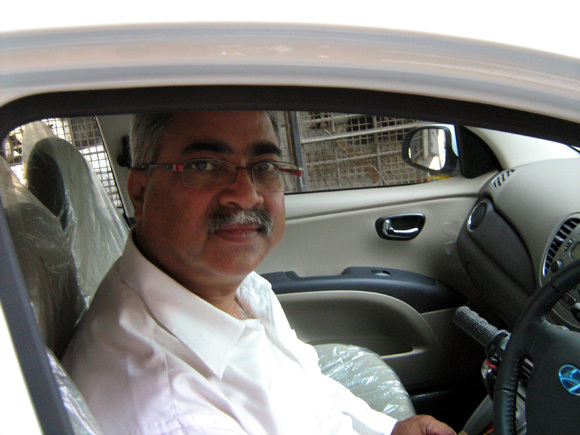 "Once I got the car, Ferdi sir made me sit in the driver's seat and taught me how to drive. He made sure that my parents were nowhere nearby. He taught me how the handle works and in 10 minutes I knew how to drive a car. I don't think anyone will ever say that they learnt how to drive a car in 10 minutes. The moment the car moved forward, it was the moment of truth. It felt like magic. I can't explain the feeling," she says with a quiver in her voice. "One of the most important things this car gave me is independence," she says with a smile. "It is just the feeling of not depending on anything or anyone else. Not having to wait for buses, autos, taxis or somebody to drive me around. Even the bus drivers aren't very considerate if I am slightly late or unable to get into the bus." Rodricks puts together small and simple concepts to make driving easy for the disabled. "It is not rocket science. His modifications are not difficult for a layman to understand. You can see the accelerator and the brake move when the corresponding levers are used." The registration for handicapped people takes longer than expected. She says, "Nobody knows what the rules are. They make us run from pillar to post to get simple paperwork done." Sanjay Joshi lost his legs in February 1990 while crossing the railway tracks. The Borivli, northwest Mumbai-based businessman, was rendered immobile for seven years until he started riding a Kinetic Honda with a side car. He then got an opportunity to operate a gas agency on his own, after which he could afford to buy a car. 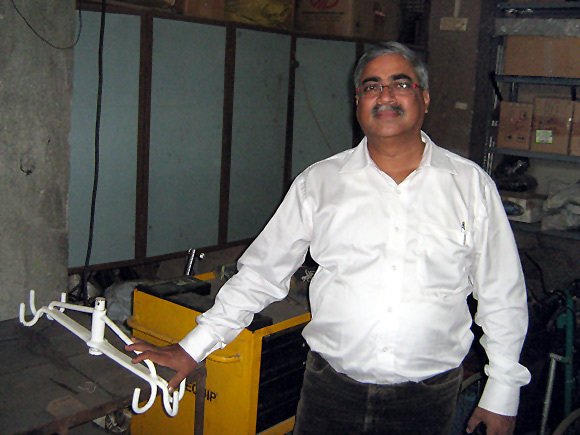 While shopping for a car, he learnt about Ferdinand Rodricks who helped him modify his car. "Ferdi is an angel," he says. "When I met him, he asked me to get in touch with others he had helped to get an idea of his work, but my requirements were different. I hadn't driven a car before. I got the car and modified it. He made it so easy for me that I can be mobile and travel without depending on anyone." His advice to people having trouble coping with their disability is, "there is no point cribbing over what has happened. It is better for everyone to move on and embrace life. There is no point being disappointed and depressed." "Ferdi is God sent. I don't know why he does what he does. He has no disability himself that inspires him. He does so many things for so many people, but never talks about it. It is not a business for him, but a sense of satisfaction he gets in helping people. It feels good when someone can actually feel your pain and do things to help you and make driving easy." For Joshi's car, apart from the brake and accelerator handle modification, Rodricks has made a special provision above the car for his wheelchair. "Now all I need to do is sit in my car, the wheelchair goes above and I'm good to go." Amol Shetty, who works for a reputed bank, contracted polio at the age of five. Life hasn't been very easy for him, but his disability hasn't stopped him from achieving things in life. He feels he has achieved more than any "normal" person. A master's in molecular biology and genetics, an MBA, and a diploma in software development, Amol says his mother carried him everywhere until he finished college. Living in a chawl in Andheri, northwest Mumbai, and hailing from a lower middle class family, owning a car and being able to drive it was a dream. He had to depend on public transport which wasn't a feasible option. "When I was ready to buy a car, I looked up online for those who modified cars for handicapped people. That's when I came across Ferdi sir's Web site." He met Rodricks three years ago and bought a car which Rodricks modified for his needs. Given Shetty's condition, Rodricks suggested he went for an automatic car, but Shetty insisted on a manual car. "Life has been bliss since then," he says. All of Rodricks' cars are modified such that the accelerator, brake and clutch are operated by hand. The clutch alone needs to be activated. The car still has the foot levers that can be operated by a normal person. He is happy to have the car and to be able to drive it, but adds that his parents are fed up with the car. "I am always out of home travelling," he smiles. He suggests that people need be a little more considerate and that public transport has to be more accessible and disabled friendly. "When we are copying the West in many ways, why not in this as well?" he asks. "Once I am outside Mumbai, I drive the car myself. I don't think I can drive within the city. There is no civic sense in people here," he says. "Ferdi Sir is an angel and is doing a great job, but nobody is willing to recognise his work. He deserves more than what he gets," he adds. Dhawal lost his legs in Class 7 while playing kabaddi with friends. He fell on his back and hurt his spinal cord. His family wasn't financially stable then to take care of all the medical expenses. Dhawal struggled through school and now takes care of his family. He started with one business and today handles five. He sounds excited when he talks about his new Wagon R. He says, "I am crazy about cars and was looking online for modified cars. I came across someone driving a car modified for disabled. That's how I got to know about Ferdi Sir and I visited his Web site. I was glad that somebody makes cars for people like me." "It is so easy. All I need to do is sit, start the ignition and go," he says. "I go to Surat every two months. Travelling by train is very difficult. Getting to the station, walking, travelling by train was a nightmare. With this car even those who don't know how to drive can drive and those who don't like driving will love it." He agrees that Rodricks feels the disabled person's pain. "He wants to make things easier for people like us," he says. "Recently," Dhawal adds, "he met someone who had a pillow attached to his seat for his left hand. It is natural that your left hand will get sore after a point. 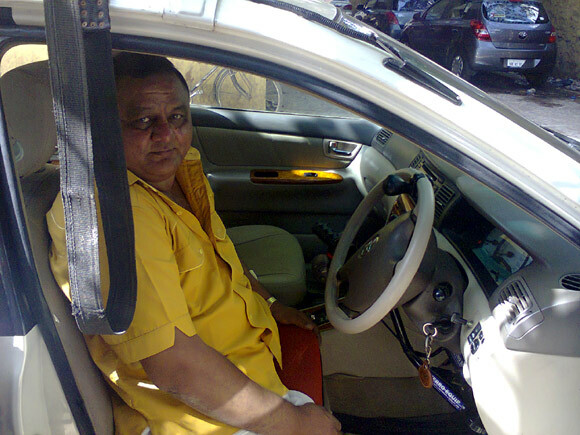 Ferdi sir understood his problem and attached a cushion to help the driver and ease his pain." Ferdinand Rodricks always had a flair for repairing cars even as a teen. He went on to study mechanical engineering and continued working with cars. In 30 years he has re-done thousands of cars to suit their special needs. "I've always been passionate about cars," says Rodricks. "I had a friend who had polio. I customised his car so that he could drive. He then sent his friend to me, whose car I modified. By word of mouth, it spread and I was designing cars for disabled regularly." Rodricks now owns a company called Ferro-Equip to help people with special needs. Apart from cars it also make hoists like a technology that helps a sleeping person shift to a chair. There is a sling and it can be used to shift a person to a toilet seat or help them into a swimming pool. None of his products are mass produced because everyone has specific requirements. "Usually people are unable to use their hands or legs and I make adjustments for the same. But sometimes they lose the ability to use both their hands and legs and have one artificial hand. I have designed cars for them as well." These cars have automatic gears. There are two pedals -- brake and accelerator -- which can be operated with the artificial hand. "A lady came to me, both her knees were affected and she couldn't walk. I designed a hoist to lift her up and put her on a chair. Now she tailors clothes to support herself. She can also move around on a wheelchair." Rodricks charges people according to their needs ranging from Rs 9,000 to Rs 37,000. After he designs the car, he takes it to the Regional Trransport Office which inspects the vehicle and approves it to operate on Mumbai's roads. Rodricks has a workshop in Neral near Mumbai where he also owns a farmhouse that is disabled-friendly. "When I am there my disabled friends come to visit and some of them stay there. They spend their holidays with me." The house is made for people with disabilities. All electricity switches are within reach from a wheelchair. Toilets are adjusted for them. They can sit at the dining table with their wheelchairs. Rodricks plans to build a rehabilitation and recreation centre for the disabled. "We have started the Ferro Equip Foundation to take this dream forward. It is going to take a lot of time and money. I am in touch with like-minded individuals, but I will not approach the government." He travels the world in a wheelchair! Extraordinary Indian: A postman who saves lives!